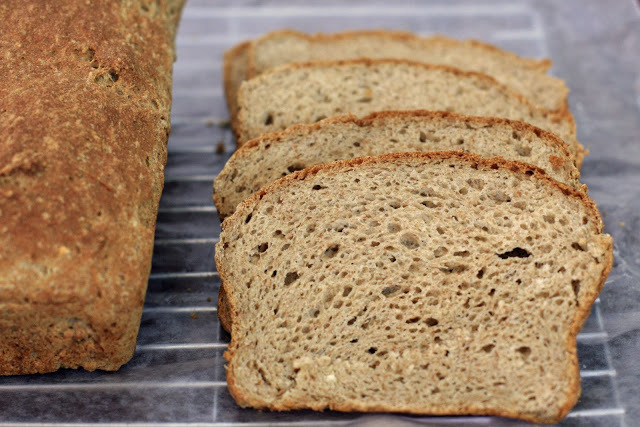 This isn’t really an Irish recipe but last week I did promise you guys a gluten-free brown bread recipe that’s great for sandwiches, so this is what I’d consider a weekend bonus recipe. Grease a 9″ x 5″ loaf pan. In a large bowl combine the brown rice flour, sorghum flour, cornstarch, teff flour, xanthan gum, yeast and salt. Mix well. In a separate large bowl (or in the bowl of your stand mixer) combine the water, cider vinegar, oil, honey, brown sugar and eggs and, using the lowest speed of your mixer, mix until combined. Add the dry ingredients and mix on medium speed for two minutes. Spoon into the prepared loaf pan and, using a wet rubber spatula, spread the mixture evenly in the pan. Let rise for an hour in a warm location. While the bread is rising, preheat the oven to 350 degrees. Bake for approximately 40 minutes.